The new Hawker BSI40 and Hawker LifeNetworkIQ systems from EnerSys are designed to provide electric lift truck and other mechanical handling equipment operators with flexible, adaptable and advanced battery management for fleets of all sizes. Each system offers energy saving, performance optimisation and other capabilities to promote life-long service reliability, efficiency and economy when used with high frequency chargers and batteries from the extensive Hawker range. The Hawker BSI40 battery status indicator provides users with detailed information on charging performance. It is designed for use with the Hawker Lifetech HF range of high frequency chargers and is ideal for smaller fleets where effective battery rotation is critical. The unit contains up to four interface panels, each of which can connect to up to 40 chargers. This provides an interface with up to 160 chargers which can be configured in as many as ten separate groups or families. In this way a single unit can manage chargers and batteries with different specifications to provide operators with a high degree of flexibility, adaptability and scalability. The device is suitable for new and retro-fit installations which means operators can introduce higher levels of control over existing battery and charger infrastructure with minimal investment. In doing so it offers a cost-effective, straightforward and affordable route into advanced battery fleet management. For larger and multi-site fleets, and where operators need the highest level of detail, the Hawker LifeNetworkIQ battery management system supports centralised and remote management of Hawker LifeIQ and Hawker LifeSpeedIQ high frequency chargers. This real-time monitoring web-based software application runs on a standard PC. It can be installed and configured very easily to manage up to 10 separate truck and battery groups, in different locations, and a large number of chargers. Users can choose hard-wired or wireless installation to provide complete flexibility. Sustainability and energy efficiency are promoted with a range of power-saving features. The system can be programmed to manage the total power used to eliminate costly spikes in demand. Chargers can be switched of and off automatically at the correct times to maintain electricity consumption within user-defined parameters. Different power thresholds can be set for certain times of the day and night to take advantage of off-peak rates and reduce energy costs. LifeNetworkIQ provides access to chargers across a local area network or the Internet so that users can manage their installations in real-time on a single site or from a remote location. This enables centralised remote control over multi-site installations to be introduced using fewer management resources but with an enhanced view of the complete battery infrastructure. The management screen provides a complete graphical view of battery and charger status including the units that are fully charged and available for use. Users have complete control and visibility of all charge cycles including complete, incomplete and equalise. Both BSI40 and LifeNetworkIQ can enforce battery rotation regimes such as first in, first out to help balance and optimise fleet utilisation. 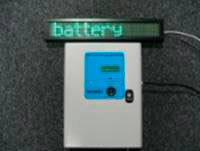 Each can be supplied with display panels which can be installed at any convenient position in the charging area to indicate clearly to the operator the best available battery to use at the next change. For more robust enforcement an optional alarm facility can be added to warn when the wrong battery has been selected. Proper rotation ensures no battery is ever under or over utilised so that all units provide the maximum life-long reliability. Overall charging times are also reduced, trucks run longer between changes, and battery performance and service life is maximised. This is fundamental to ensuring high levels of equipment availability to support demanding 24/7 multi-shift applications in warehousing, retail and manufacturing. Each system monitors and collects information on battery utilisation and performance that can be included in built-in reports or exported for further analysis. With the BSI40 the information can be transferred by USB memory stick to any PC running the system's analytical and reporting software. LifeNetworkIQ reports and information are generated in easy-to-understand graphical views that are available in real-time on a PC connected locally, over a local area network or the Internet to support remote and centralised management operations. Details include available units, time of charges and changes, and alarm events. With both systems the information provides users with the insight into battery utilisation and performance that enables them to make informed decisions. Reports can be issued by email and SMS alerts can provide complete flexibility and ensure access even when users are away from their desk. 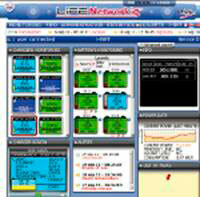 Additional information is available when LifeNetworkIQ is used with the Hawker Wi-IQ or Wi-IQ2 battery controllers. These monitor a battery's status and check for operational parameters such over-charging, high operating temperatures and when a battery needs to be topped up as well as identifying potential faults that could lead to an unscheduled outage. When fed into the LifeNetworkIQ system this additional data provides an additional level of battery fleet management performance. High frequency chargers from Hawker typically have efficiency levels of over 90% and charging factors of 1.08 to 1.15 depending on the battery technology. These efficiencies can produce reductions in energy consumption of more than 15% compared with conventional 50Hz charger technology which means a lower carbon footprint and significant financial savings. Correctly specified and installed, the chargers are matched to the batteries and automatically detect the level of discharge and supply only the amount of power needed - and no more - to restore full charge. This means less mains power is required and there is reduced risk of the overcharging that can lead to degraded battery performance and premature failures.